“And outlast them all,” Brzezinski confirmed. 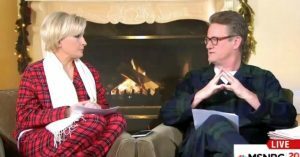 Both hosts were seated in front of a fireplace wearing pajamas and slippers. Trump on Thursday tweeted that the U.S. “must greatly strengthen and expand its nuclear capability until such time as the world comes to its senses regarding nukes”—a statement that seemingly echoed Russian President Vladimir Putin’s call for nuclear expansion in his own country. That’s despite the fact that the U.S. and Russia are both expected to trim their weapons stockpile by February 2018 under the new Strategic Arms Reduction Treaty (START). The U.S. currently has about 4,500 nuclear warheads and 1,500 deployed warheads. John Tierney, executive director of the Center for Arms Control and Non-Proliferation, said Trump’s tweet was “dangerous” and that expanding America’s stockpile risked an arms race. “It is dangerous for the president-elect to use just 140 characters and announce a major change in U.S. nuclear weapons policy, which is nuanced, complex, and affects every single person on this planet,” he said in a statement to Politico. Reactions to Brzezinski’s reporting reflected both on the dangers of Trump’s statements and the surreal setting of the holiday-themed morning show.